One Kansas City senior center hopes Chiefs mania can help it overcome an unexpected budget shortfall. The Don Bosco Senior Center will raffle off a framed, autographed Patrick Mahomes jersey. Raffle tickets are $25 apiece or five for $100. The center will limit sales to 1,000 tickets. The drawing will take place when all the tickets are sold or August 1. KANSAS CITY, Mo. — One Kansas City senior center hopes Chiefs mania can help it overcome an unexpected budget shortfall. 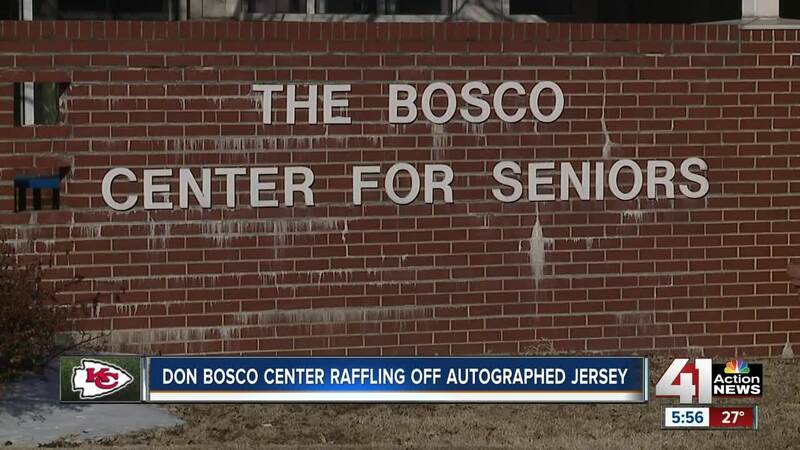 The Don Bosco Senior Center will raffle off a framed, autographed Patrick Mahomes jersey. Raffle tickets are $25 apiece or five for $100. The center will limit sales to 1,000 tickets. The drawing will take place when all the tickets are sold or August 1. Mo Orpin, the center’s executive director said bad weather forced the center closed 11 times this winter. Each time the center is closed, it does not receive reimbursement costs from it's primary funder: the Mid-America Regional Council. Orpin said the center receives roughly $4,000 each day. "We still have our operational costs, the staff still comes in, we pay them [on days when we're closed]. We've still ordered the food we were going to serve those days," Orpin explained. John Strada played for the Chiefs in 1974 and now serves on the center’s board of directors. He said Mahomes has captured the attention of Chiefs fans more than any other player in recent memory. "When you have these kinds of situations develop where you have no control over them and lose that kind of money when you're on a tight budget like the center is, it has an astronomical effect," he said. He bought the first 25 raffle tickets of the raffle with a $500 donation. The Don Bosco Center is located near Campbell Street and Independence Avenue. It serves nearly 500 seniors a hot meal daily through cafeteria service and deliveries via Meals on Wheels. The center’s goal is to help seniors socialize and remain in their homes. The second place prize in the raffle is a dinner for four at Garozzo’s Italian restaurant. Click here to buy raffle tickets. You can also purchase tickets in person at the center.